This book gives short and to-the-point teachings that most people have never realized were in the Bible. It is jam-packed with information (much of it newly discovered) from history and archaeology that will make people say "I could hardly believe that was the teaching of the Bible." For example, the tablets of the 10 commandments were actually pocket size contrary to the common projection given by Charlton Heston in the film, "The 10 Commandments." The sections in the book include questions about God, the Bible itself, Bible Chronology, Hell, Bible Prophecy, Sexuality and the Bible, Christian Doctrines, Rituals and Salvation, Bible History, The Garden of Eden and the Flood of Noah, the theology of Hollywood and Political Bible Translations. Readers will be surprised to discover how the Israelites crossed the Red Sea. You will find out the meaning of the mysterious number 666. 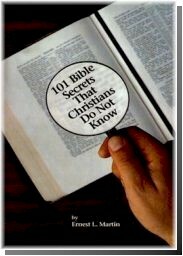 This is one of the most interesting books you will ever read concerning the Bible. It will make the biblical revelation take on a new meaning -- and a sensible one. Potential markets include pastors, Bible believers of all denominations, students of chronology and prophecy and those interested in the current Bible/Science debate.